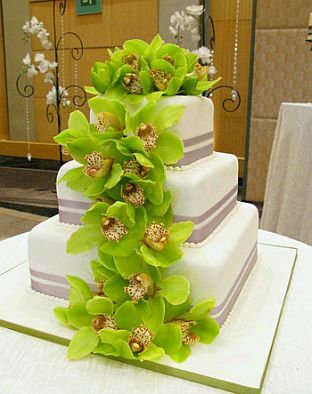 If you already decided to have a wedding with green details, surely you know that you have to choose the appropriate decor, floral arrangements or centerpieces that blend best and of course, the cake or wedding cake. 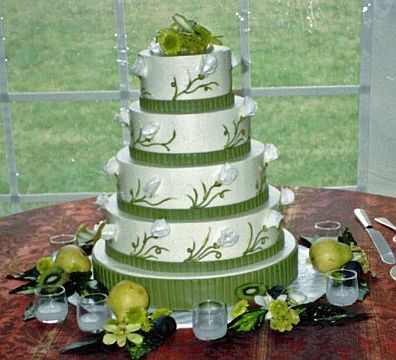 To choose you have to first think the number of guests to your marriage and accordingly determine the size, similarly, you should use the wedding cake accessories you used in decorating, call them, fruits, ribbons, butterflies or anything else. But to look perfect, wedding cake should go hand in hand with the style of your celebration, formal, casual, romantic, original, etc.. 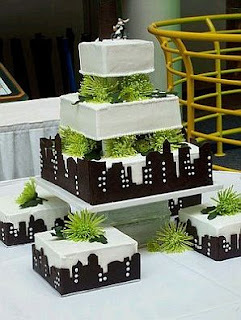 Finally, it is no less important, the choice of flavors, is a job you need to give yourself enough time to define, you may decide that all have the same flavor cake, but also interesting when each floor has one own. Here are some beautiful ideas for cakes with green details. 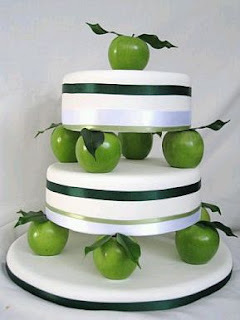 Wedding cake with apples and green ribbons. 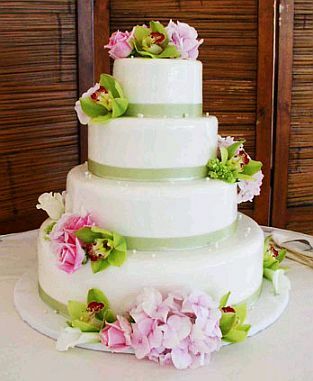 Wedding cake with pink and green flowers, ribbons also complement each floor. 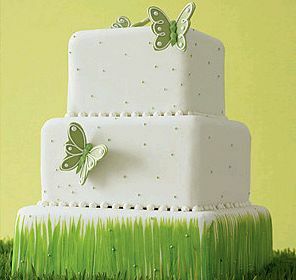 Wedding cake adorned with green moths in high relief. 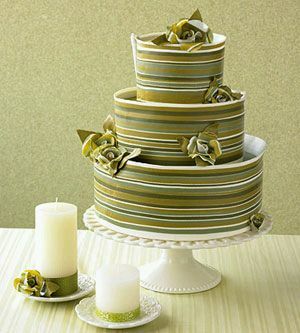 Great Wedding Cake of 5 floors, ideal for an informal ceremony with lots of guests, the decor includes two floors decorated with green and brown lines, two with green coconuts and one with green and brown fields. Romantic weddings cake decorated with coves water irises. 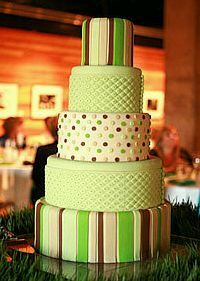 For an elegant and distinguished wedding cake this is right, but also has green flowers decorated with horizontal lines of different shades of green. 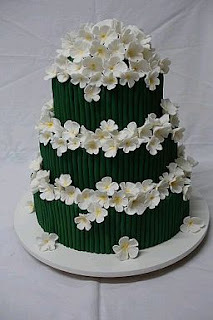 Peculiar cake with ribbons and green branches, flowers are also the top of this color, while each floor has white flowers in high relief. 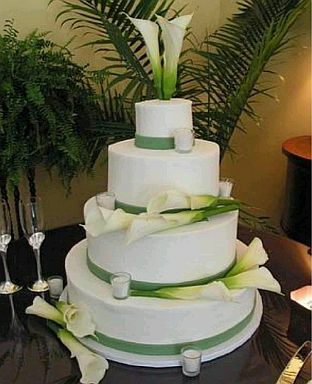 Green cake decorated with lots of white flowers in both the top and the separation of each floor. Decorated cake with white and green nice flowers . Original model with green flowers between each floor and the representation of a large city with skyscrapers, made with chocolate. 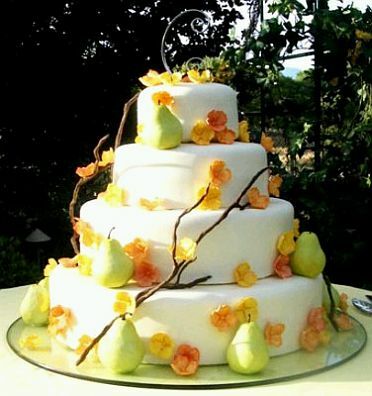 Wedding cake decorated with orange flowers, yellow and green pears.